Hypaspistai, or hypaspists, were elite foot guardsmen as used by Alexander the Great's Macedonian army. 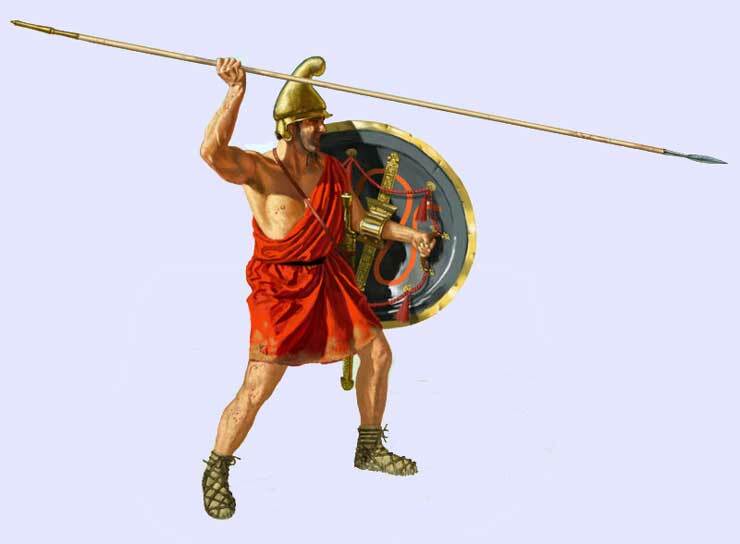 They often fought on the right of the Foot Companions; the right was the position of honor in most Greek armies. Examples of their use include the Battle of Chaeronea (338 BC) where he exploited their mobility tactically to good effect. Arrian's phrase 'tous kouphotatous te kai ama euoplotatous' (eg atIV 28 viii) has frequently been rendered as 'lightest armed' although Brunt Appendix XIX paragraph 9 concedes it is more properly translated as 'nimblest' or 'most agile'. The hypaspists were raised from the whole kingdom rather than on a cantonal basis; they were the King's Army rather than the army of the Kingdom. Alexander was subsequently to reorganise the whole army along these lines in order to strengthen his authority over the otherwise powerful local allegiance felt by his men. In battle they were probably armed just like the foot companions with aspis, spolas, helmet, greaves and sarissai although their equipment would be more ornate.